Ben Wilson lies prone to paint flattened gobs of chewing gum. MUSWELL HILL, England — When first exposed to the art of Ben Wilson, or to Mr. Wilson in the act of creating it, people tend to respond with some degree of puzzlement. "When I first saw one, I thought it was a fruit sticker," said Matt Brasier, who was walking through this north London suburb the other day. A woman named Vassiliki, who was passing by, said that when she came upon Mr. Wilson, prone and seemingly inert on the sidewalk, "I thought he wasn't very well." She added: "I was like, ‘What is he doing?' 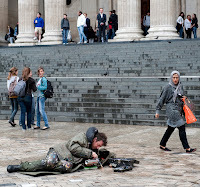 And they told me: ‘He's painting the chewing gum.' "
That is exactly what he was doing. 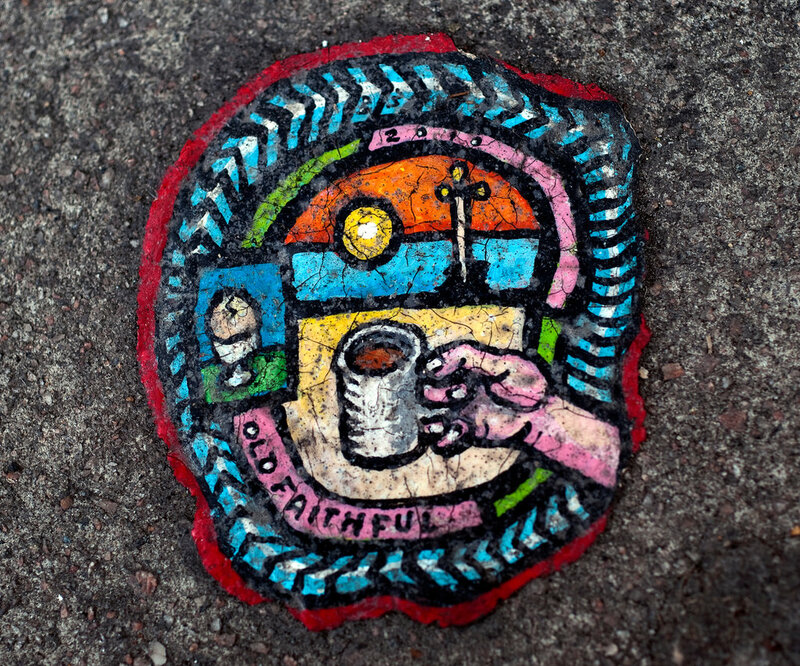 Mr. Wilson, 47, one of Britain's best-known outsider artists, has for the last six years or so immersed himself in a peculiar passion all his own: he paints tiny pictures on flattened blobs of discarded chewing gum on the sidewalks of London. 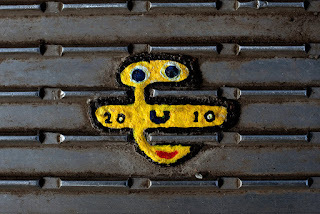 So familiar is he here, painting in any kind of weather, that he has become something of a local celebrity and mascot. "He brings a lot of joy to a lot of people," said Peter Kyriacou, who owns the local Snappy Snaps photography store, which has a number of Wilson works out front. 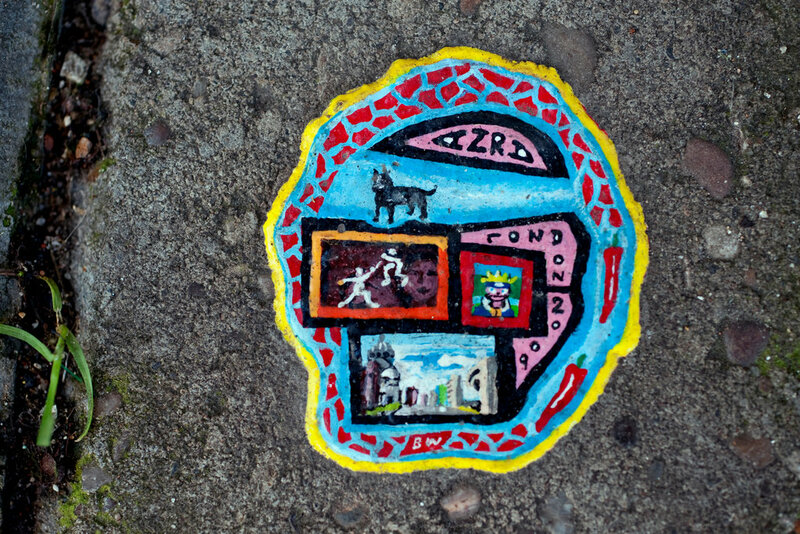 Mr. Wilson reckons he has painted many thousands of chewing gum pictures around London. Weird as the pursuit might be, the result is lovely: seemingly random spots of color amid the gray that, on closer examination, turn out to be miniature paintings of just about anything: animals, landscapes, portraits and, often, stylized messages of regret, thanks, commemoration and love. Pedestrians tend to crowd around when they see him at work. "People are always coming up to me asking me for pictures, for different reasons," Mr. Wilson said. Ben Wilson at work in Muswell Hill in north London. 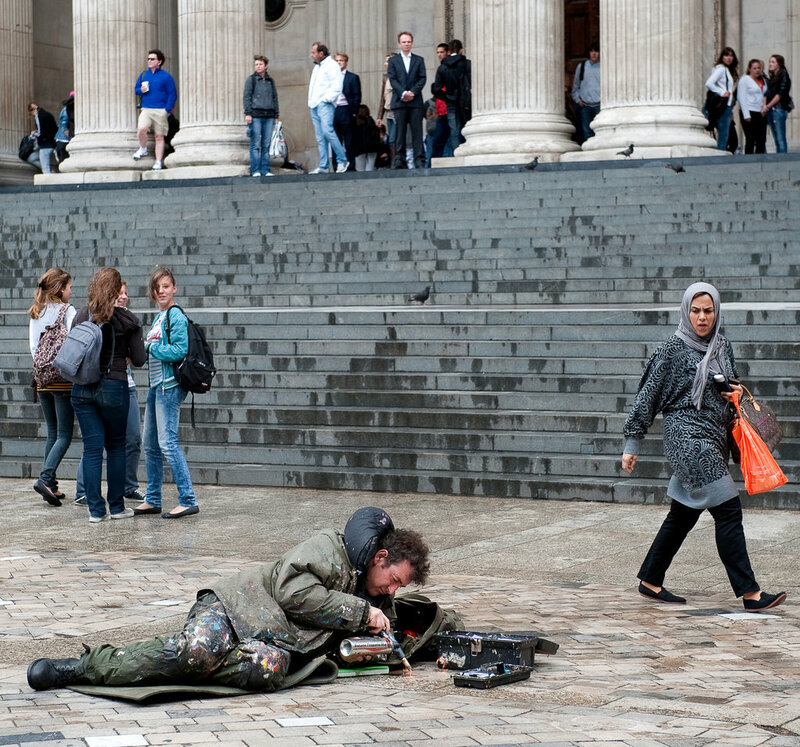 He has been painting chewing gum on London streets for the past five years. Mr. Wilson, who grew up in a family of artists, might seem like just a local eccentric, but he has achieved much attention for his unusual art, working apart from traditional conventions and institutions. He created some of his earlier pieces — mostly enormous wood structures built in forests and fields, some commissioned, many not — in places as far away as Australia, Finland and Baltimore. Several years ago, he was an artist in residence at Lehigh University in Bethlehem, Pa. Though his girlfriend's salary from her job as a teacher's aide helps, as does the occasional sale of his (normal-size) paintings, Mr. Wilson does most of his work for no pay, feeling, he said, that the paintings and how they relate to the community are an end in themselves. 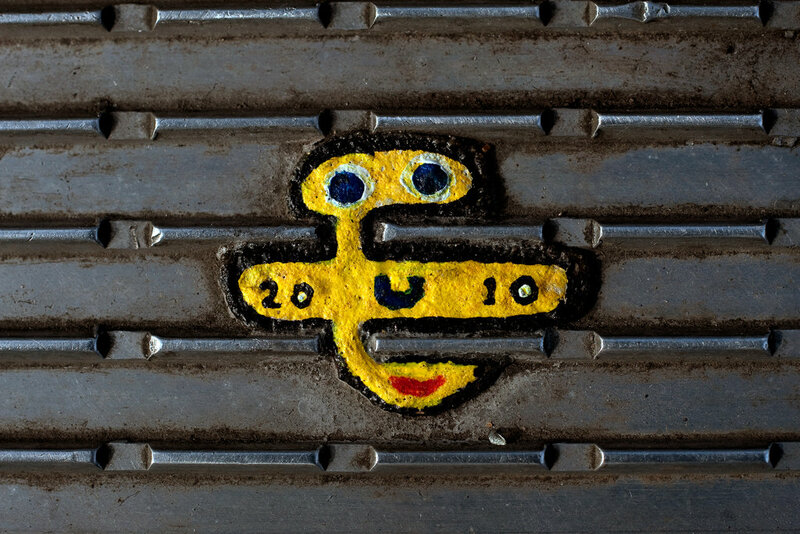 His current project was inspired by a variety of concerns: the scourge of chewing gum on city sidewalks, people's carelessness about the environment and how advertisements, not art, rule the urban landscape. Fill in the missing words after reading the article! Töltsd ki a hiányzó részeket, miután elolvastad a cikket. 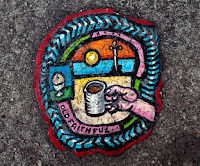 Mr. Wilson ... paints tiny pictures on flattened blobs of discarded chewing gum on the sidewalks of London. So familiar is he here, _________ in any kind of weather, that he has become something of a local celebrity and mascot. "He brings _________ lot of joy to a _________ of people," said Peter Kyriacou, who owns the local Snappy Snaps photography store, which has a number of Wilson works out front.